The word epergne is taken from the French word epargne, which means economy. 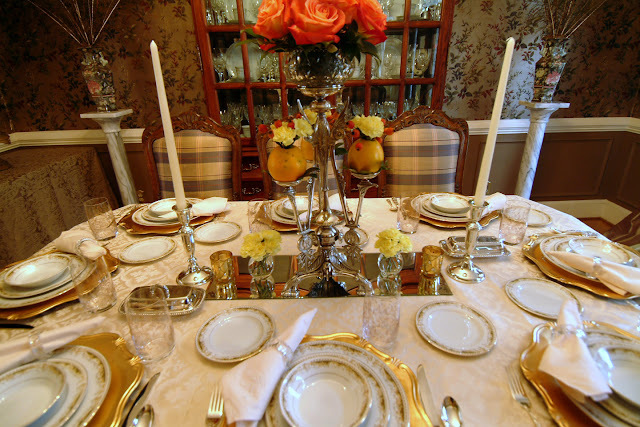 An epergne usually has a large bowl in the center, with branches or arms that extend out holding smaller baskets, bowls, candle holders, or dishes of some sort. Today it is used as a centerpiece, and I have been searching for an epergne since I saw one on the pages of a Southern Living Christmas book in 2004. I found one this week at an auction, just in time for Thanksgiving. Woohoo!! It's a bit on the flashy side, but it's unusual, and I think it was a pretty good buy. I used it as my centerpiece for one of my tables today. I had 17 for dinner, and I am exhausted to say the least, but we had such a wonderful time being together, and everyone pitched in with the cooking. 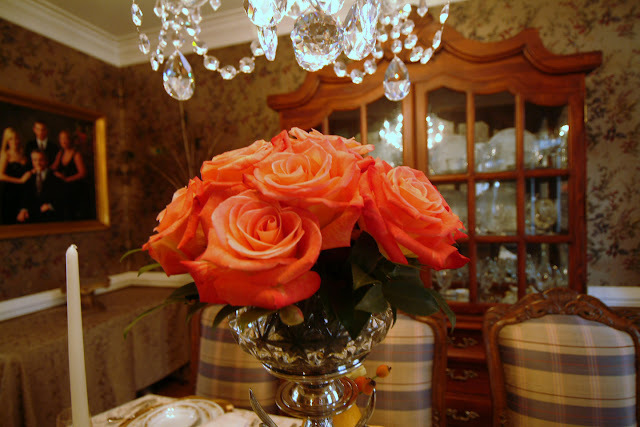 My Victorian style epergne holds a bowl of roses at the top. The three arms or branches, as they are sometimes called, hold oranges filled with flowers and rosehips. Small bowls would normally be placed on the branches, but the oranges seemed to fit better without the bowls. 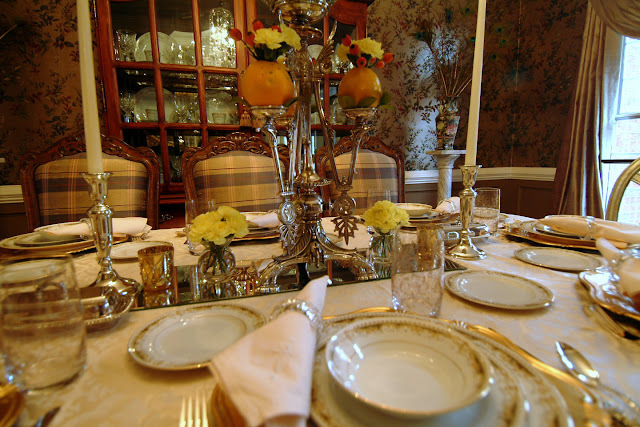 The epergne was used to save space when all the food was placed on the table. It was also used to serve rare nuts, fruits, condiments, and other luxuries from the East. 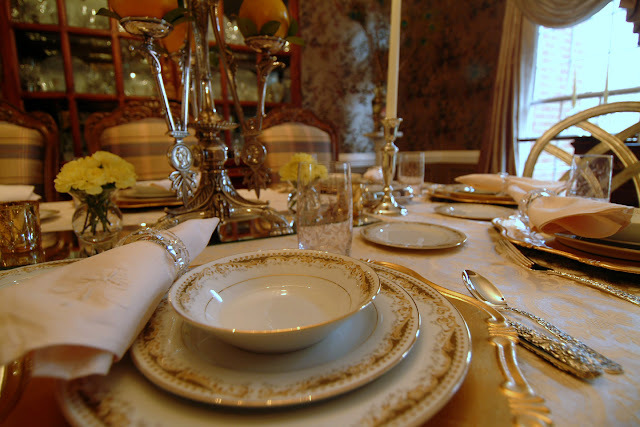 Guests would serve themselves from the epergne. For this Thanksgiving table, I used my Mother's china, Signature Collection, Queen Anne (Japan). The green and gold colors remind me of autumn. 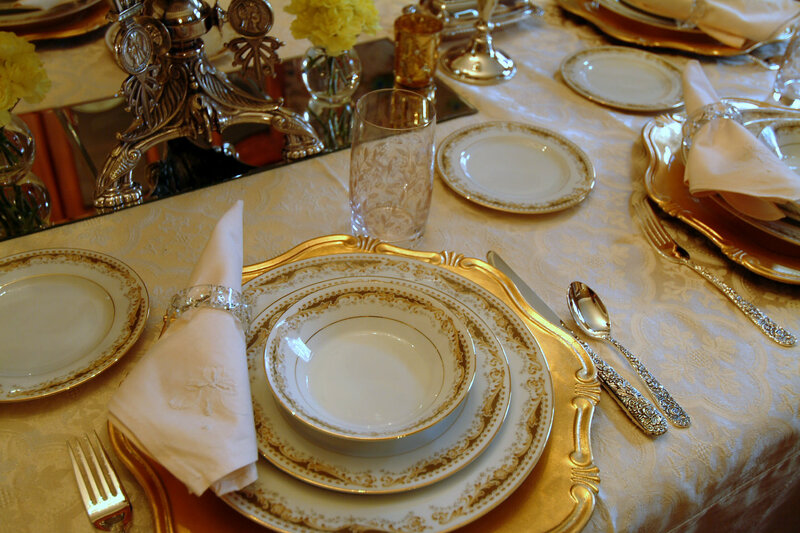 By using some of her china and other items, such as the crystal napkin rings, I feel that she is with us in spirit! 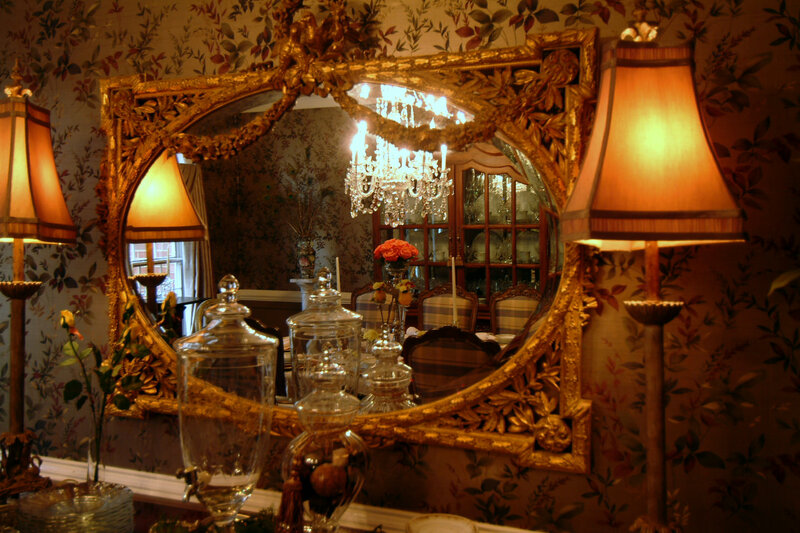 I also found a new mirror at the auction, I love the way it reflects the table in this picture. Now on to table No. 2! Neither one of my tables will fit 17 people, so I have set two, one in the kitchen and one in the dining room! 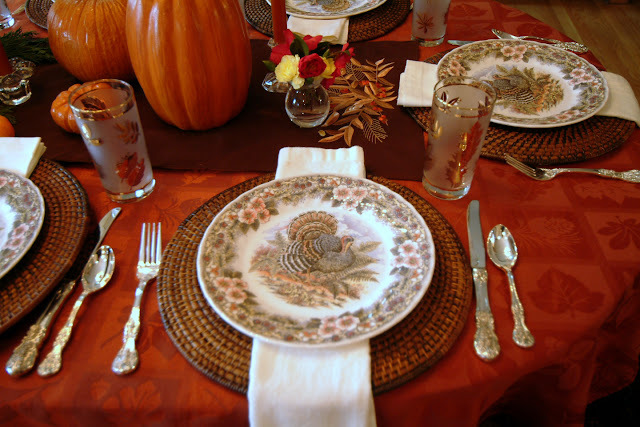 A bit more casual, I am using brown chargers from Target and Thanksgiving plates by Queens. 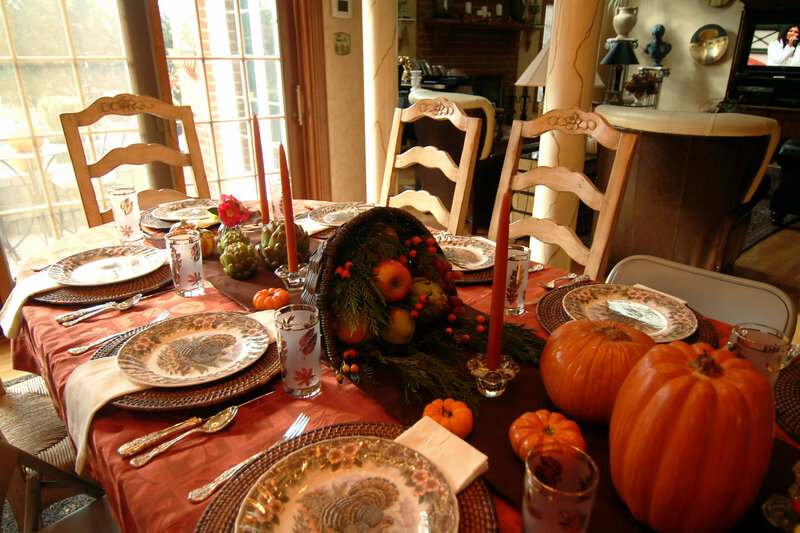 I have been so blessed this year and on this Thanksgiving I am giving thanks for my health, my wonderful family--especially my hard-working husband who allows me to play with my dishes, my extended family, my friends, and those who have gone before me. Thanks be to God!! I hope you and yours had a wonderful Thanksgiving holiday!! Now on to Christmas!! Thanks for visiting, as I strive for A Perfect Setting!! 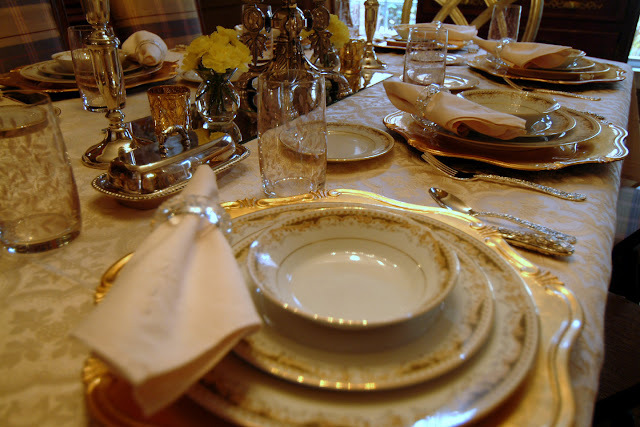 But tables are beautiful...your mother's china is lovely. Gorgeous epergne! I'm sure your 17 guest were impressed! 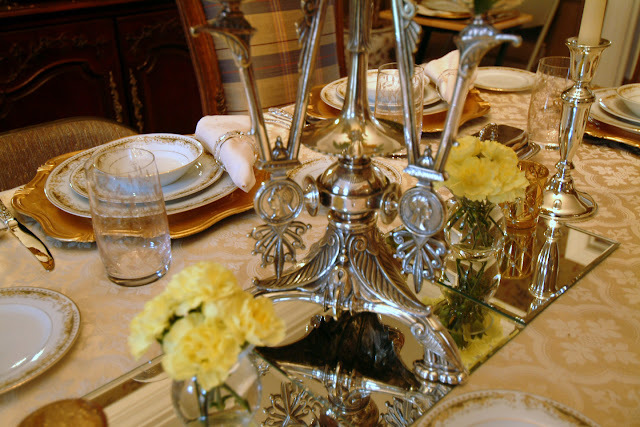 Love a post where I learn something....like what an epergne is! Such a pretty new treasure! Love your new to you epergne. Both of your Thanksgiving tables are so pretty. Very pretty! I love your unique centerpiece. 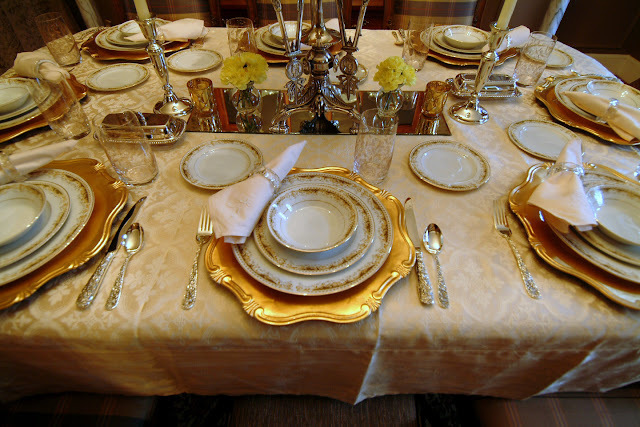 Your tables are beautiful, as is your house. I have never seen one of those French centerpieces, its very intriguing. 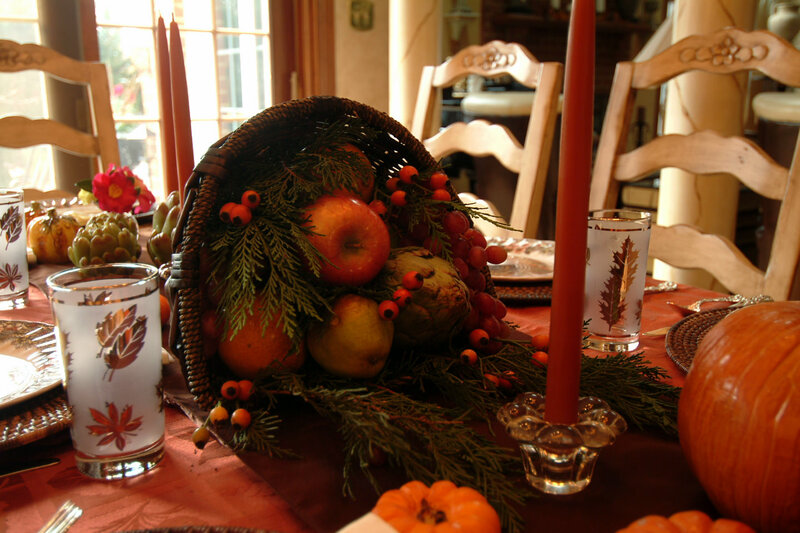 I can see the practicality of it, I'm still trying to get my family used to the idea of a centerpiece, it just annoys them when I put one on (it's a new thing for me, getting inspired by blogland). Oh my goodness, 17! Well I was exhausted after only 6 of us I just can't imagine 17! 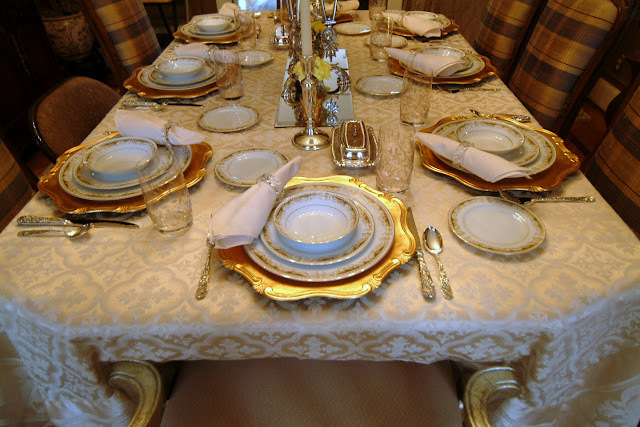 But I will tell you this, I love both of your tables, both very different, both very elegant. What lucky family and friends you have! 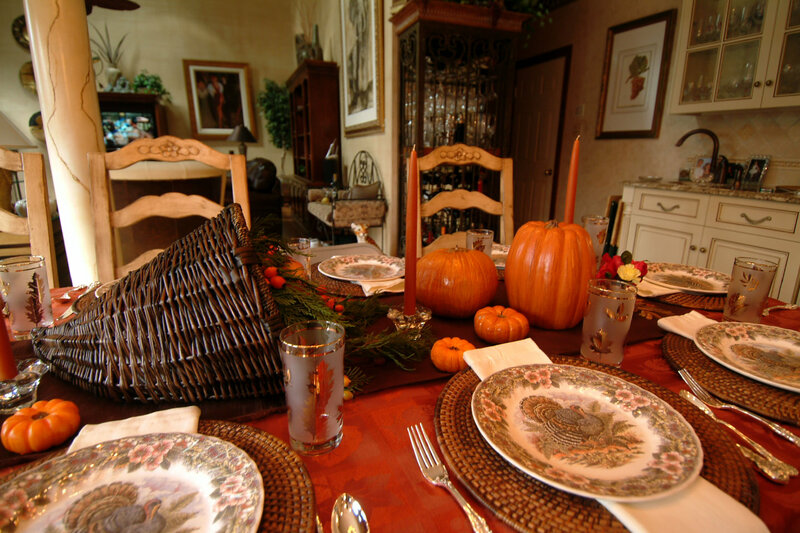 Happy Belated Thanksgiving -- Your new epargne is lovely! Your whole dining room looks stunning. Love those plaid chairs. And your new mirror is also beautiful! I also love your kitchen chairs! Can I move in? LOL! 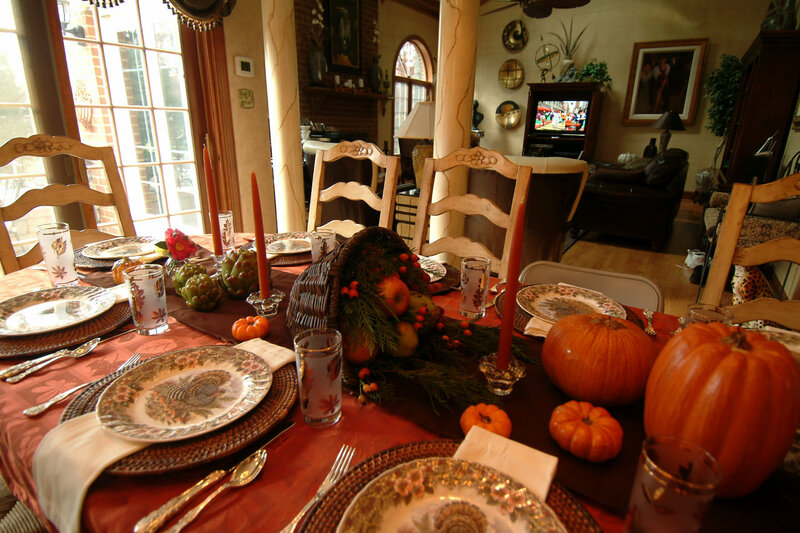 Both tables are beautiful and so very different. 17 People for dinner...wow! There were only 4 of us and it was a busy day! Hi, Betsy! I'm so glad you found an epergne! I remember you made the comment on my blog in September that you were looking for one! The one you got is gorgeous! 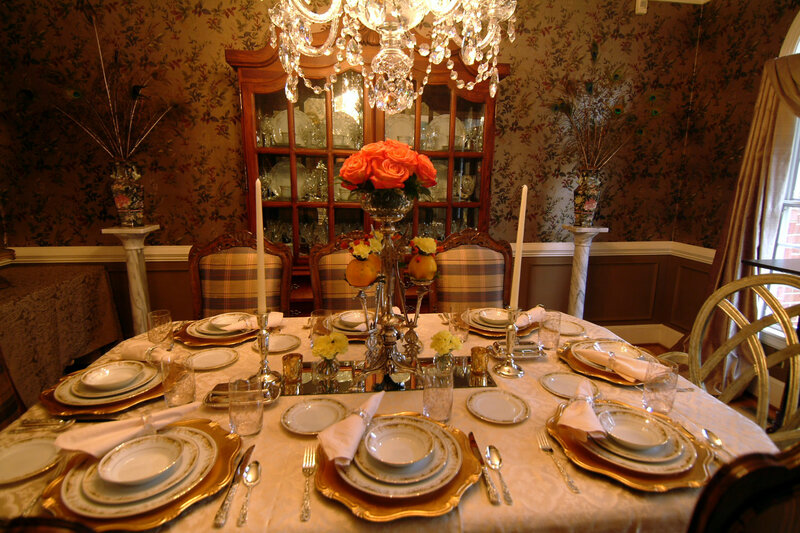 I went with my crystal epergnes this Thanksgiving, too. I love the detailing!!! Your table looks fantastic! The china is exquisite!!! Hi lovely lady, Your Tablescape is so Beautiful! What an elegant table in the dining room! 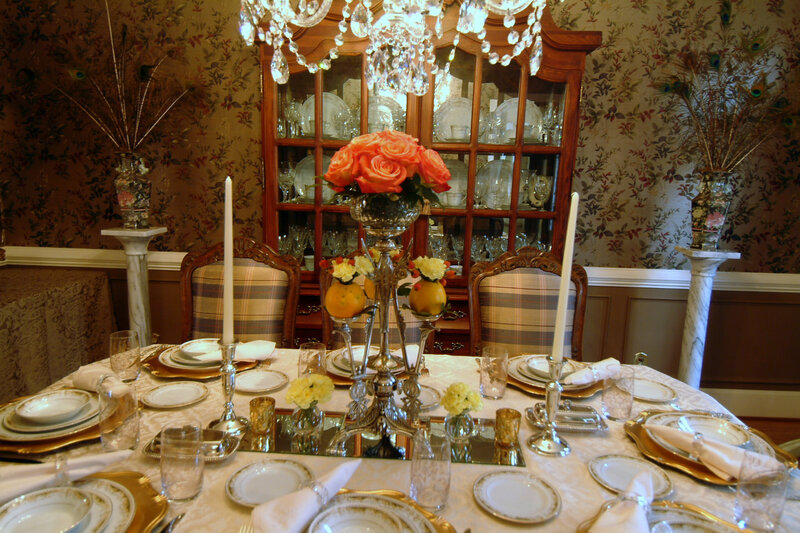 I love how you decorated the epergne, and your mother's china is just beautiful -- what a treasure! 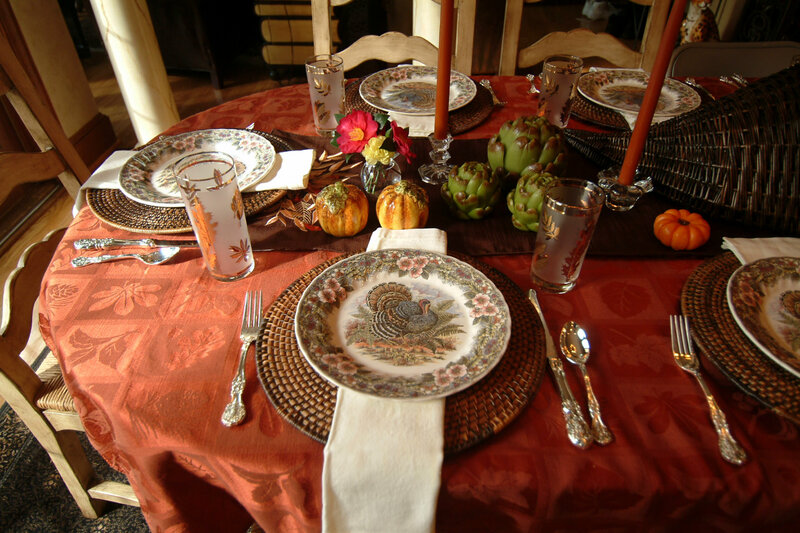 I used my grandmother's for Thanksgiving, as it also has fall colors, and it always reminds me of what a wonderful hostess she was.